The fear trade is alive and well even in this incredible bull market. Listen to AM radio for an hour and you will likely hear at least one commercial for gold or annuities. Humans are hardwired in such a way that pain registers more significantly than gain. The predisposition to obey fear has been passed down through the generations in order to avoid and escape predators. The caveman who investigated a rustling in the bushes ended up as a bear’s lunch. The caveman who ran away lived to hunt another day. Today’s environment is different. The humans who give in to fear run straight into the jaws of the bear. Today’s predators use fear to separate humans from their hard-earned money. These fear tactics are destroyers of wealth. They pull money away from wealth creating assets and towards wealth destroying assets. There is an argument to be made for owning precious metals or gold in a portfolio, but not a huge allocation and certainly not by buying from a radio advertiser. Gold is a non-correlated asset (it doesn’t necessarily move in relation to stocks or bonds) which is good, but it doesn’t necessarily create wealth. Gold does not pay a yield and it is beholden to the ‘greater fool‘ investment strategy which can backfire if it turns out that you’re the last in a long line of fools and get stuck holding the hot potato. Uncle Warren is not a fan of gold. Personally, I leave precious metals out of my portfolio, but if you absolutely must own gold bars, do some research on where to buy. Fees vary wildly between gold dealers and it can be difficult to make comparisons between them. If you have been frightened into holding physical gold in preparation for the ‘IMPENDING ECONOMIC COLLAPSE OF AMERICAN SOCIETY’, you’re better off buying jewelry or coins than bars or a slip of paper that says you own some bullion in a vault in New York City. Jewelry or coins would be much easier to trade, plus you get some enjoyment out of them before the fall of civilization. A win-win. Just don’t tell your significant other that their new watch or necklace is actually a calculated hedge against an implosion of the global banking system. Of course if we do end up in a Thunderdome situation, the folks with a basement full of single-serving liquor bottles will rule us all. So maybe carve out an allocation to liquor if your financial plan includes the certain doom of the human race. Annuities are another product whose sales are fueled by fear. What doesn’t get advertised are the incredible commissions the salespeople make on each sale and the fees that quickly snowball. Comparing a variable annuity with a similar portfolio of securities often shows the fees quickly devouring principal. An annuity might be right for someone who needs to be forced to save or doesn’t have the discipline to follow a financial plan, but for most people it’s difficult to see the advantage versus more liquid investments. The key takeaway here is to be aware that there are people out there who make a living by selling fear. Financial experts are being shouted down by financial celebrities and financial pornographers. Financial experts don’t usually have anything flashy to say. They have a long-term view and change their financial plans according to an investor’s changing goals or life events. Financial celebrity is one of the few professions where the male talent is more likely to have a ponytail than the female talent. They ask questions about why the market went down today and where the market is going to be in twelve months as if these are the keys to building wealth. Financial pornographers are the folks whose livelihoods depend on extrapolating actual data to absurd conclusions in the hopes of rousing as much fear as possible from anyone listening. For example, a financial pornographer might overlay a chart of the stock market during the Great Depression over a chart of the stock market from a recent period of time to make it look like we are at a market top then ask if you are prepared for the next Great Depression. It’s difficult to resist fantasizing about the what-ifs of investing. What if the market goes down and never goes back up? What if the dollar becomes worthless? They are merely what-ifs meant to make a quick buck for the salesperson, however. A financial plan concerns itself with things that are likely to happen. Will the market go down? Yes, and disciplined rebalancing will boost the portfolio when the market goes back up. 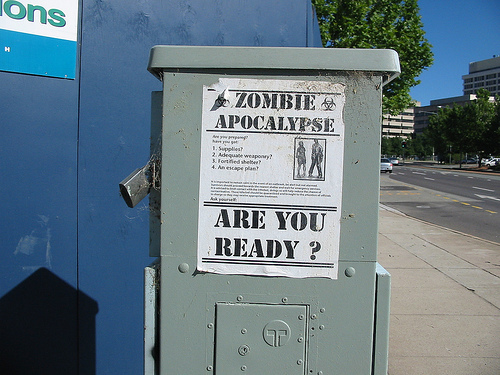 In the end, preparing for financial apocalypse is like preparing for a zombie outbreak.